Manipur Chief Minister N Biren Singh and Arunachal Pradesh Chief Minister Pema Khandu on Tuesday attended the Hornbill Festival at Kisama Heritage village near Kohima. “Manipur CM N Biren Singh and Arunachal Pradesh CM Pema Khandu at Kisama Heritage Village, to be part of the Hornbill Festival. I hope you both have a pleasant stay,” Nagaland Chief Minister TR Zeliang tweeted on Tuesday. Over 73,090 people including local, domestic and foreign tourists have visited the ongoing Hornbill festival of Nagaland at Naga Heritage Village Kisama. 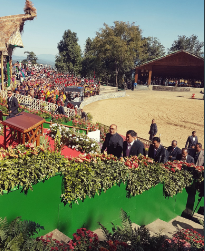 Till the first three days of the festival at Kisama, which was inaugurated by President Ram Nath Kovind on December 1, a total of 912 foreigners, 9,748 domestic tourists and 61,430 local visitors have witnessed the different events, informed Tourist Officer and Statistical-in-charge for Hornbill, Toka E Tuccumi.